Hi, I am interested in your 2001 Chevrolet Corvette Z06 Coupe (stock #1154-NSH) listed on Autotrader for $26,995. I'd like to get more information about this vehicle and confirm its availability. There are so many reasons that this Z06 is special. First, it is the successor to the awesome ZR1 that came before it. Better than that, largely because the engine is so much lighter, but also because of suspension improvements, it outperforms the ZR1 everywhere except for top speed. Finally, with only 14,000 miles on it, this car is barely through break in. Come on down and check out this very clean, very low mileage, 100% stock and unmolested Z06. Black is an awesome color for a car as long as it is kept perfectly clean and perfectly flawless. This one has been. And it looks awesome. The coupe, or fixed roof coupe (FRC), has a minimalist, no nonsense look to it. The car seems to sit even lower than usual for a Vette. The fender lines bulge up and around the tires both front and rear cutting a muscular look. The roof seems like it was carved around a driver and passenger creating just enough room to work in, but it actually offers more space than it appears to and even has a rare feature for a Corvette, a real live trunk with a Z06 emblem visible when it is opened. A couple of the benefits of it being made like that are improved chassis rigidity, which the chassis design team likes, and lighter weight, which translates to more speed, and everyone likes that! Z06 special rims look great and show off the big red calipers clamping massive rotors behind them. Open the door to check out the inside and you will find a Black interior with little to no wear which is consistent with a pampered low mileage car. You will notice that the door panel has controls for many of the comfort and convenience fingers right at your fingertips. Power windows, locks, mirrors, and even separate power seat memory positions for you and your significant other. Those seats are leather high back buckets that invite you to slide on in and get comfortable. They have pleated seating surfaces with smooth bolsters and Z06 embroidered into the headrests. The beefy leather wrapped steering wheel feels good in your hands and a quick flick of the wrist to the right is the shifter for the 6-speed manual transmission. The Z06 dash is backlit and gives you a 200-mph speedometer as well as a 6500 rpm redline tach and they are flanked by the engine gauges. Air conditioning, cruise control, and a nice stereo for your listening pleasure round out a comfortable place to do some serious driving. Of course, even with those stunning good looks and comfortable leather interior, the star of the show with this car is the Z06 engine. So go-ahead, pop the hood and have a look. There you will find that marvelous motor, 100% stock and unmolested by modifications nestled down in a very neat and clean engine bay. It looks very appropriate primarily in black but does wear some striking red covers with Corvette in script on them to grab your attention. Power flows back through that 6-speed transmission through an independent rear end working through the now familiar leaf spring. They started using a carbon fiber leaf spring up front recently too, and it has been refined and fine tuned along with the rest of the suspension to provide more awesome performance and handling than ever before. The rubber meets the road through 295/35R18s in the rear and 265/40R17s in the front. 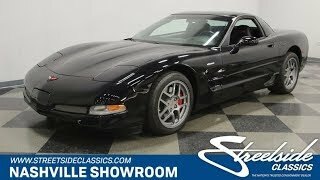 A super clean, super low mileage Z06 coupe. Special for so many reasons. Come on down and check this one out.